Marauders (MRD) are the other primary tanking class alongside GLD and PLD. They are focus more on taking straight damage and dealing damage to build enmity. As Marauders don't have much actions that help them mitigate damage besides parrying, they have a higher HP pool to draw from and several abilities that let them replenish their HP pool by themselves. Marauders deal more damage than Gladiators, so they are the prefered choice for encounters with high DPS requirements. Leveling a MRD to 30 and a GLD to 15 will unlock the main job for Marauders called Warrior (WAR). Warriors utilize most of what the Marauder has done up to this point, though they have a new ability that help raise their 'Wrath' against enemies. 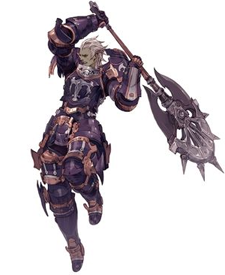 Wrath will help Warriors build a larger HP pool, but will cost them a loss of their damage abilities, however, once enough Wrath is obtained the Warrior's critical hit rating increases to make up for this damage loss.